Holiday gifts that feel good to give and to receive! These "gifts from the heart" are our popular holiday tribute cards! 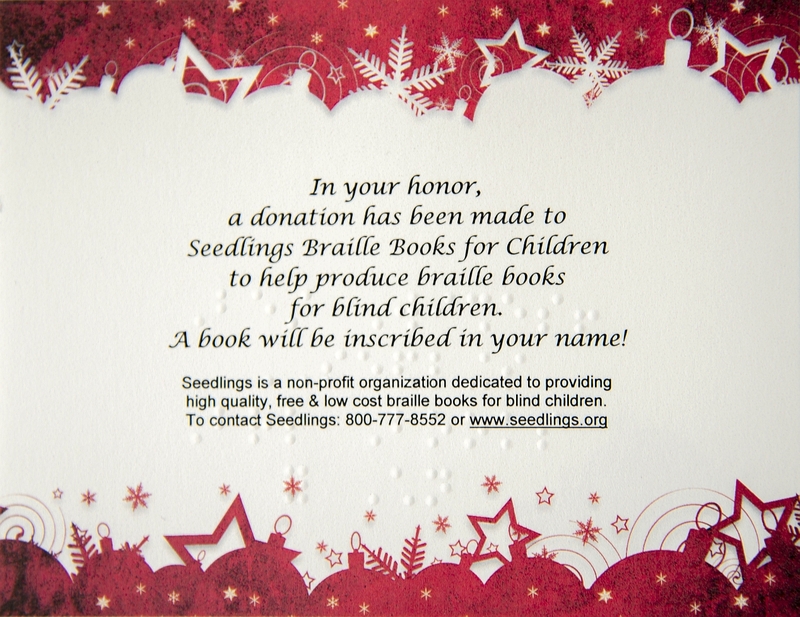 For each $10 donation to Seedlings Braille Books, you will receive an elegant card (as pictured on the right hand side of the screen) to give to the special people on your list. Thanks to your generous donations, thousands of children have received the gift of reading through Seedlings' braille books! We hope it warms your heart to know that when a child's eager hands glide across the braille pages, seeds are planted and lives are changed. Thank you for all of your help! We sincerely wish you and yours a very happy holiday season and a New Year of good health and good books! Enter your honoree's name in the space provided. Use the "Continue shopping" link on the next page to add more tribute cards to your order. On the Paypal form, please be sure to include YOUR MAILING ADDRESS! We will mail the cards to you so you can give them to your honorees. Thank you! The tribute cards and envelopes will be mailed to you right away, and the braille books, inscribed with your honorees' names, will soon be on their way to our eager braille readers, making their holidays brighter also! DONATE BY MAIL: To donate by mail, please print this form, enclose your check or money order (payable to Seedlings) or credit card information and mail it to the address below. DONATE BY PHONE OR FAX: Call toll-free 1.800.777.8552 or fax 734.427.8552, Visa, Mastercard or Discover only.